Amazon's Blu-ray deal this week presents an offer you wouldn't want to refuse! 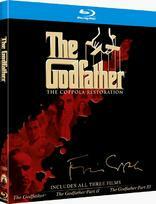 The online retailer is now selling the must own boxed set 'The Godfather - The Coppola Restoration Giftset' for $49.99 (60% off suggested list price). Click here to order this fantastic set and keep that horse's head out of your bed! The deal will run from now through June 18.